Sciatica is pain felt in the buttock, thigh and/or calf as a result of compression or irritation to the sciatic nerve. The pain can vary from an intense irritating ache to crippling lancing or shooting pain that zips down the leg. In addition there may symptoms associated with a trapped nerve such as pins and needles, numbness or weakness (most commonly experienced in the feet). The sciatic nerve can be imagined as an inverted tree, the “nerve roots” emerge from the spinal column in the lower back and join to form the trunk of the sciatic nerve in the buttock. The sciatic nerve then extends down the back of the thigh to behind the knee where it the splits in to two branches, the Tibial nerve and the Peroneal nerve. The sciatic nerve is therefore capable of being “pinched” along any length of its pathway from the lower back to the calf to cause sciatic type pain. To make matters even more confusing certain conditions can produce “pseudo- sciatica” i.e. pain that is similar to sciatica but not originating from irritation the sciatic nerve but from tissues that cause “referred” pain similar to sciatica. 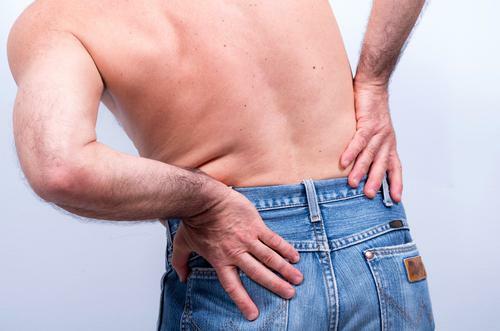 There can therefore be various causes for sciatica each needing a distinct treatment. Different causes can also co-exist at the same time, therefore requiring a combined approach treatment plan. The key to successful treatment starts with accurate diagnosis. Some of the most common causes of sciatic type pain are listed below. Piriformis is the name of a muscle deep in the buttock. In around 20% of people the sciatic nerve runs through the middle of the muscle, therefore tension in this muscle is capable of causing pinching the sciatic nerve. Treatment is aimed at successful release of this excess tension and can involve deep massage and dry needling. Trigger points or knots in the buttock muscles can cause referred “pseudo-sciatic” pain similar to sciatica. We use dry needling (acupuncture needles) and deep massage for such conditions which often proves very effective. The facet joints are the knuckle sized joints that occur either side of each segment of the spine. The nerve roots emerge from the spine very close to these facet joints. Swelling or degeneration of the facet joints can cause pinching or chemical irritation to the neighbouring nerve root. We treat these problem with a combination of dry needling, manipulation and corrective exercises. In extreme cases facet joint injections may be required to reduce the nerve irritation in which case we refer to our partner pain doctors in Harley Street. A bulging disc is the most common cause of sciatica, the bulge can press on the neighbouring nerve root that forms part of the sciatic nerve. For severe cases surgery is required to excise the bulge but this often is not necessary and only used when other treatments have failed. For the last two years we have been using a new treatment in our clinics called IDD Spinal Decompression Therapy. IDD uses computer controlled pulling forces to distract very specific segments of the spine, where the bugle is, in order to reduced pressure on the disc and encourage healing. Medical trials show the success rate for significantly reducing or eliminating pain with IDD Therapy is 70 – 90 %. Since using this ground breaking technology we have been able to help many more patients than was previously possible and prevented several from undergoing surgery. For more information see our new web video on IDD and genuine patient testimonials.